Many of you know that I have an English degree. I love books. I love reading. I love letting well-crafted, tightly-written words and their layers of meaning wash over me. I love flipping pages, I love holding books, and I love the world of possibility one feels walking into a bookstore or library. Work, adulthood, ADD tendencies, housekeeping, and marriage--these have all somewhat slowed down my reading pace over the past several years. Turns out I no longer have endless alone time in the evenings before going to sleep. Perhaps my love of reading/books/libraries is closely intertwined with my love of winter and cloudy days? There's nothing else you "should" be doing outside when it's cold, rainy, or dark. You can legitimately be snuggled up inside, reading, under your snuggie (in front of your space heater), and no one can suggest otherwise. ...And plus, what sunny day-images are conjured up when reminiscing old favorites like Jane Eyre, Sense & Sensibility, or Wuthering Heights? That's right--zero. All clouds and moors. 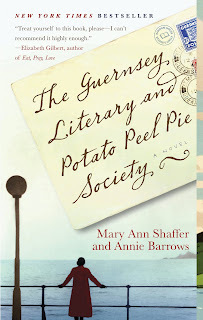 First up, The Guernsey Literary and Potato Peel Pie Society, by Mary Ann Schaffer and Annie Barrows. Absolutely loved it! totally delightful. I loved the letter-writing format, I loved the heroine, and I loved how clever the storytelling was. Flew through this one. In fact, I read it while we were in Arizona, and retired early one night to read because I couldn't wait to find out what happened next. I was also completely captivated by the historical fiction aspect. Five stars! Next was a book Mandi loaned me, The Art of Racing in the Rain, by Garth Stein. This was a sweet story told in the first-person by a dog about his owners. Although I enjoyed it, and read it almost in one day (on the plane coming back from AZ), I did think the racecar-driving parallels were kinda self-indulgent, and skipped over them as the plot got going. The author would deviate into chapters of "how to race in the rain," and it was a little too dramatic. Beyond that, it was a good read (and made me wish we had a puppy asap!). 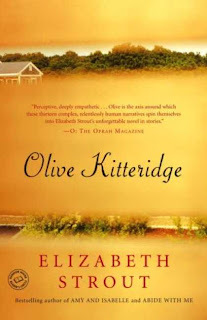 Just finished the Pulitzer Prize-winning Olive Kitteridge, by Elizabeth Strout. This one was told in more of a short-story format, based in a coastal Maine town, but all revolving around or coming back to Mrs. Olive Kitteridge in one way or another. My mom said it best, "It was hard to read a book about a woman I didn't like. But I'm so glad I did." Yes, it was hard at first, but when the book got going, I really appreciated how she was flawed and weird--the whole thing slightly reminiscent of Winesburg, Ohio. This one gets my "Run, Don't Walk" label. What have you read lately? Recommendations? Throw 'em out! Come on, I know yall read (even though book posts don't usually get as much lovin')... what's really "made your skirt fly up" lately, as P-Dub says? p.s. if you have trouble remembering books you've read or want to read, may I recommend goodreads.com? You can track here what you've already read and/or want to read. It's helpful to have it all in one place, especially if you tend to be scatterbrained at all. I am reading Gilead by Marilynne Robinson and am absolutely loving it. Noticed it was on your goodreads. I have a tentative goal to read (at least) one book per month in 2010.
i really needed some good book recommendations! i love to read once i've gotten into a book, but i often have trouble picking it up to start - so many distractions, as you said. 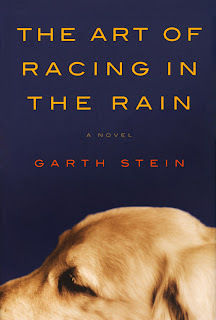 i got "the art of racing in the rain" when we got stuck in the airport on the way home from our honeymoon, but i started getting nervous that whenever my dog sniffs me, she smells cancer...so, 8 months later, i still haven't finished it. weirdo, i know. Love love love the post! I'm always in the market for a good read rec. Keep them coming! LOVED Gilead. It was a little more work than these three, but so tender and beautiful. FINISH AORITR! you'll love the end and just skip over the racing chapters. I can relate, I use to get in trouble as a kid for reading when I was supposed to be doing homework, cleaning my room, brushing my teeth, etc etc. I am reading the Anne of Green Gables series and so far, it is wonderful! I have actually made a resolution to read one book a week this year. I have started a blog reviewing the books I've read: 52booksayear.wordpress.com. If you haven't read "Girl with the Dragon Tattoo" by Stieg Larsson, I would definitely recommend it.